An artist's interpretation of a magnetar. Magnets and the magnetic force are ubiquitous in our everyday lives, helping to guide us in unfamiliar territory and attach our kids' artwork to the fridge. But other than those common examples, magnetic fields always seem to play second fiddle in the symphony of forces in the universe. Sure, every once in a long while they may get to call the shots — like in the extremely dangerous environments of a magnetar or the extremely useful environments of an NMR scanner — but for the most part they simply exist, getting pushed around by their more powerful cousins. A single particle with electric charge, sitting all by its lonesome, not doing anything interesting, will generate an electric field. This field surrounds the particle on all sides and instructs other charged particles how to move in response. If a similarly charged particle is nearby, it will be pushed away. If an oppositely charged particle is far away, it will be gently tugged closer. But if you put that electric charge into motion, a surprising thing happens: A new field appears! This strange and exotic field behaves in a strange way: Instead of just pointing straight toward or away from the charge, it twists around it, always perpendicular to the direction of motion. What's more, a nearby charged particle will only feel this new field if that particle, too, is in motion, and the force it feels is again perpendicular to the direction of its motion. This field, which for the sake of convenience we'll call the magnetic field, is thus both caused by moving charges and only affects moving charges. But your fridge magnet isn't moving, so what gives? Your magnet itself isn't moving, but the stuff it's made of is. Each and every atom in that magnet has layers and layers of electrons, and electrons are charged particles with a built-in property known as spin. Spin is a fundamentally esoteric and quantum property (and the subject of another article), and while it's not technically correct to think of electrons as tiny little spinning metal balls … for the purposes of magnetism, we can think of electrons as tiny little spinning metal balls. These electrons are charges in motion, and each electron generates its own miniscule magnetic field. In most materials, the different orientations of the electrons cancel out any macroscopic field, but magnets are exactly those kinds of materials where a lot of electrons line up all neat and tidy, making a magnetic field big enough to stick something to your fridge. 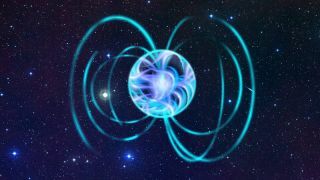 Because all the magnetic fields we see in the universe are generated by moving charges, you can never isolate a north and south magnetic pole (a "monopole") from each other. They always come in pairs. If you take a magnet and chop it in half, you just end up with two smaller, weaker magnets — their internal electrons are still whirring about, same as they always were. This property of magnets was (and is) so well known that James Clerk Maxwell — the dude who figured out that electricity and magnetism are fundamentally connected — simply baked the statement "no such thing as a magnetic monopole" into his equations and left it at that. And for decades, we had no reason to suspect otherwise, so we let it stand. But as our eyes began to gaze on the weird and wonderful subatomic world, our growing understanding of quantum mechanics put some new wrinkles on that idea. And Paul Dirac, a pioneer of the quantum realm, noticed something funny lurking in the deep math of this new physics. If, as a thought experiment, a magnetic monopole were to exist, and if you were to pair it with a plain boring familiar electric charge, then the two would begin to rotate. This rotation is actually independent of distance; it doesn't matter how far apart those two particles are. But Dirac knew that angular momentum (momentum going in a circle, as in this rotating pair) is quantized — angular momentum in our universe comes in discrete values. This is true for all things, including our peculiar pair. So here's the kicker: Using this reasoning, Dirac realized that if angular momentum is quantized, then the charges on those particles must be quantized as well. And since this effect is independent of distance, if a single magnetic monopole existed in the entire universe, then that would directly lead to the quantization of charge, something that we had taken as experimental fact without theoretical justification … until then. The connection between electricity and magnetism discovered by James Clerk Maxwell wasn't just superficial. He realized that they were two sides to the same coin — electromagnetism. A changing electric field can create a magnetic field, and vice versa. What's more, the phenomenon known as light is simply what happens when electricity and magnetism start wiggling each other. Albert Einstein, a huge fan of Maxwell's work, took it one step further. He realized that there was a connection between electricity, magnetism and motion. Start again with the same lonesome electric charge with its boring electric field. What if you start running past it? Well from your perspective, the charge would be the one appearing to move. And what do moving charges do? That's right — they create magnetic fields. So not only are electric and magnetic fields two sides of the same coin, but you can transform one to the other just through the simple act of moving around. And that also means that different observers will disagree about what they see: Some stationary observer might see an electric field, while a more mobile observer would spot the exact same source generating a magnetic field. It was this line of thinking that led Einstein down a path to what we now call special relativity, a bedrock of modern science. And we have the humble magnetic field to thank for it. Learn more by listening to the episode "How do magnets work?" on the Ask A Spaceman podcast, available on iTunes and on the Web at http://www.askaspaceman.com. Thanks to Dan H., David H., and @BrendaHattisbur for the questions that led to this piece! Ask your own question on Twitter using #AskASpaceman or by following Paul@PaulMattSutter and facebook.com/PaulMattSutter. Follow us on Twitter @Spacedotcom and on Facebook. Original article on Space.com.